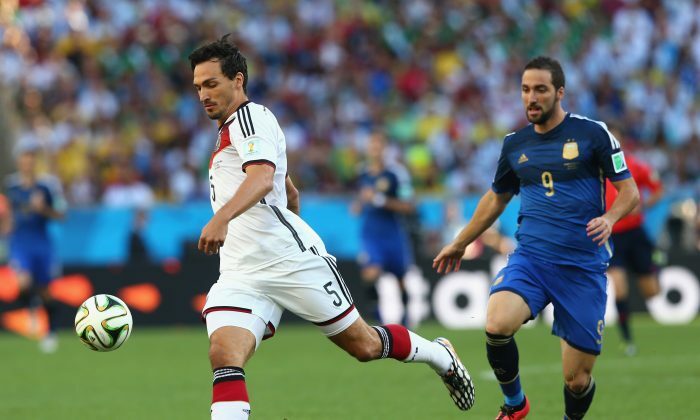 Barcelona are going to make a move for Mats Hummels. The German defender had an excellent World Cup 2014. Hummels kept the Germans solid at the back, and was not afraid to make the occasional marauding run forward, with one run made past the half way line in the Brazil-Germany semi final being a memorable instance. New Barcelona boss Luis Enrique would have certainly noticed Hummels’ performances, and is looking to bring him to Camp Nou, according to reports in Spain. Also, with Barca not looking likely to sign Marquinhos from PSG or Jeremy Mathieu of Valencia, and with the departure of long-time center back and captain Carlos Puyol, Hummels is looking more and more likely like a perfect replacement. If Enrique manages to sign Hummels, it would mean that Manchester United, who have long targeted the Borussia Dortmund man to replace Rio Ferdinand and Nemanjic Vidic, will have to start looking elsewhere for defensive cover. RIO DE JANEIRO (AP) — The World Cup title for Joachim Loew and his “golden generation” crowned a process that was 10 years in the making. With a talented crop of new players coming through, the future looks bright for Germany. The 1-0 victory over Argentina at the Maracana that gave Germany its fourth title and made it the first European team to win the championship on South American soil completed a circle for Loew that began in 2004, when he became Juergen Klinsmann’s assistant. The two friends began plotting how to bring the title back to Germany and rejuvenated the team, creating an attacking, entertaining style that pleased the eye and promised success. Germany fell short at home in 2006, finishing third, and Klinsmann stepped down to leave Loew in charge. Loew’s team reached the final of Euro 2008, finished third again at the 2010 World Cup and was a semifinalist at Euro 2012. With doubts growing whether Loew’s Germany could ever become a champion, the team pulled off the historic run in Brazil, including a stunning 7-1 victory over the host in the semifinal. A meticulous planner who leaves little to chance, Loew made risky decisions that turned out right. He gave key midfielder Bastian Schweinsteiger time to slowly nurse himself back into the team after a series of injuries and Schweinsteiger was one of the heroes of the final. Loew reshuffled the defense when needed and returned his only true striker, Miroslav Klose, to the starting line-up. Forward Thomas Mueller, who led the team with five goals, said he was pleased for Loew. “I am happy for the coach, because he was always in the final or semifinal in recent years,” Mueller said. Midfielder Toni Kroos said the team trusted Loew and his decisions. As Germany returns home to celebrate the title with thousands of fans in Berlin, Loew might be contemplating his future. His contract runs through Euro 2018 and he has indicated he intends to stay on. “We’ve been working for years on our own style. This title will be a shot in the arm for the future. We have players who are still very young and not many players over 30,” Loew said. “As for Klose, you never know, you can expect anything from him,” Loew said of the 36-year-old striker. Klose has been noncommittal on his future. Mario Goetze, who scored the match winner in the final with superb control and technique, is 22 and at the start of a promising career. Marco Reus and Ilkay Gundogan missed the tournament with injuries but will be back. Kroos, Mesut Ozil, Andre Schuerrle and Sami Khedira are all young, while Schweinsteiger and captain Philipp Lahm are still 30 or younger despite being in the team for 10 years or more. “We have young players who can still achieve something in their careers,” Loew said.